The use of small Unmanned Aerial Vehicles (UAVs) called Drones is rapidly transforming the way we go to war. Drones were once used for land surveillance, Delivering Pizza's, then equipped with bombs that changed the way nations conduct war and last year, these hovering drones were also used to hack Smartphones. Recently, a security researcher has found a backdoor in the Parrot AR Drones manufactured by a French-based company, that could allow a malicious hacker to remotely hijacked the radio controlled flying quadcopter helicopter. The Parrot AR Drone, revealed at the International CES 2010 in Las Vegas, is a quadricopter helicopter which you can control with your smartphone or tablet. It features two built-in cameras, is easy to fly, and can be controlled without too much danger of it flipping over or smashing into things. Security researcher, Rahul Sasi claimed to have developed the first ever backdoor malware for AR drone ARM Linux system, dubbed Maldrone [MALware DRONE]. 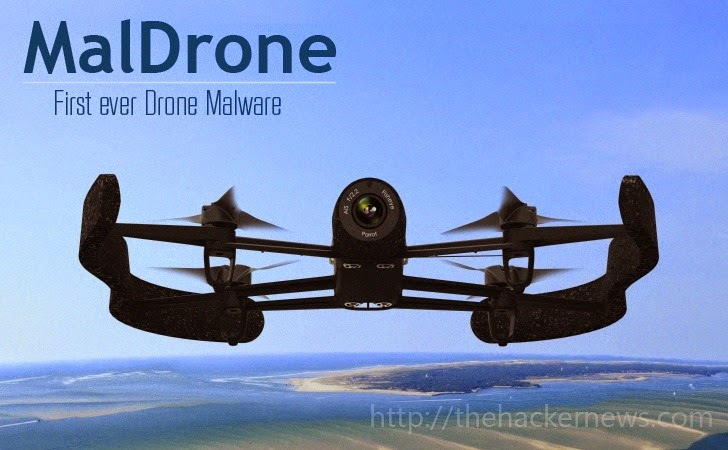 Maldrone can be used to remotely hijack drones, as shown in a video demonstration below published by the hacker. "In this we would show infecting a drone with Maldrone and expecting a reverse tcp connection from drone. Once connection is established we can interact with the software as well as drivers/sensors of drone directly. There is an existing AR drone piloting program. Our backdoors kills the autopilot and takes control. The Backdoor is persistent across resets," video explained. According to the researcher, Maldrone can interact with the drone’s device drivers and sensors silently and allow the hacker to control the drone remotely. As a result, Maldrone could be used to conduct remote surveillance. Rahul said the Maldrone could also be used to attack other drone makers as well. However, the backdoor could be exploited within a wireless range. Drones has highlighted the growing security threat posed by small Unmanned Aerial Vehicles (UAVs). Just recently, a 2-foot quadcopter drone crashed onto the White House grounds in the early hours of Monday morning, when the president and first lady Michelle Obama were in India. A government employee told the Secret Service that he lost control of the quadcopter drone before it crashed on the grounds of the White House. However, no one at the White House were in danger.